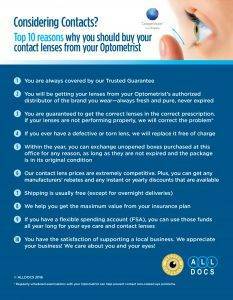 When it’s time to purchase new eyewear, the services offered by LensCrafters is full of advantages. As the largest optical chain in the United States, LensCrafters excels in taking care of your eyes, no matter what you need. With years of experience since the foundation of LensCrafters in 1983, our office is fully equipped and part of a national retail chain for prescription eyewear and sunglasses. Providing superior customer service and convenience, we feature eyewear, eye care services and on-site labs all under one roof. In comparison to a private optometry practice, all of our eye care services are very affordable, with no compromise on quality. Our LensCrafters eye doctor will perform a comprehensive examination of your eyes, at a price to fit any budget. To ensure that your eye assessment is as accurate as can be, we use the exclusive Clarifye technology at both of our LensCrafters locations. This revolutionary digital eye examination will literally show you a picture of your vision. Through the use of simulation tools and videos, you’ll be able to visualize what’s happening with your eyesight, such as by displaying a clear image of the topography of your eye. t to create a lens fit with perfect precision. In the event of any damage or breaks, we also have an equipped lab for repairs. If you’re looking for the ultimate in quality, convenience and friendly service, we invite you to join our LensCrafters eye care experience. Please call for an appointment with our LensCrafters eye doctor, or visit our office!